Hello everyone! 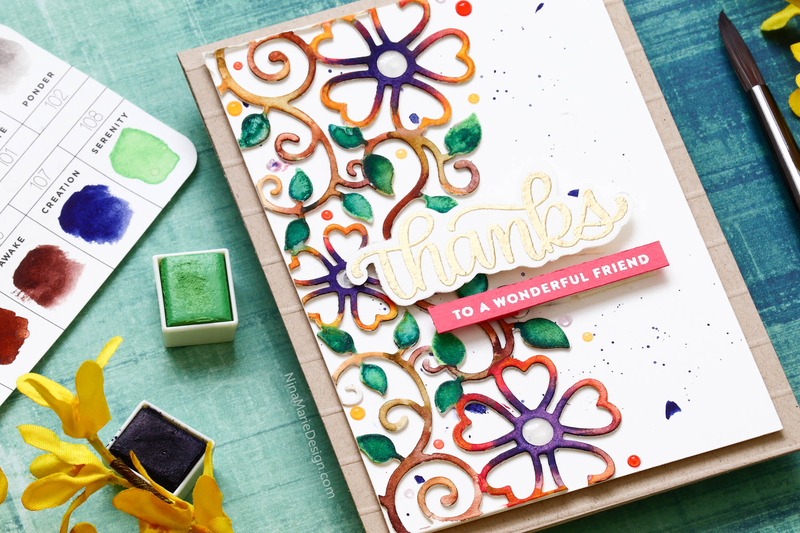 I am thrilled to be back with you today sharing a bit of watercolor and die cut inspiration with you that also happens to feature Spellbinders products! I really wanted to have a video for you on how I created this card, but I was away on a trip and was delayed getting home; this prevented me from being able to get the video edited uploaded to my YouTube channel. If you would like to see a video on creating a similar technique to what I used in this card, you can watch this tutorial HERE on my blog. 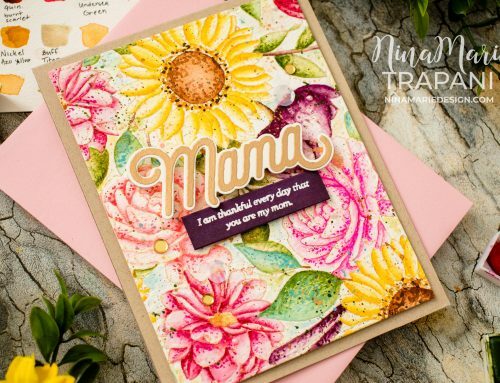 Today’s inspiration also happens to be part of the Spellbinders April blog hop, showcasing some of their latest products! I’m using the beautiful Top Floral Panel die, which I’ve watercolored with Prima’s Essence, Woodlands and Pastel Dreams palettes. 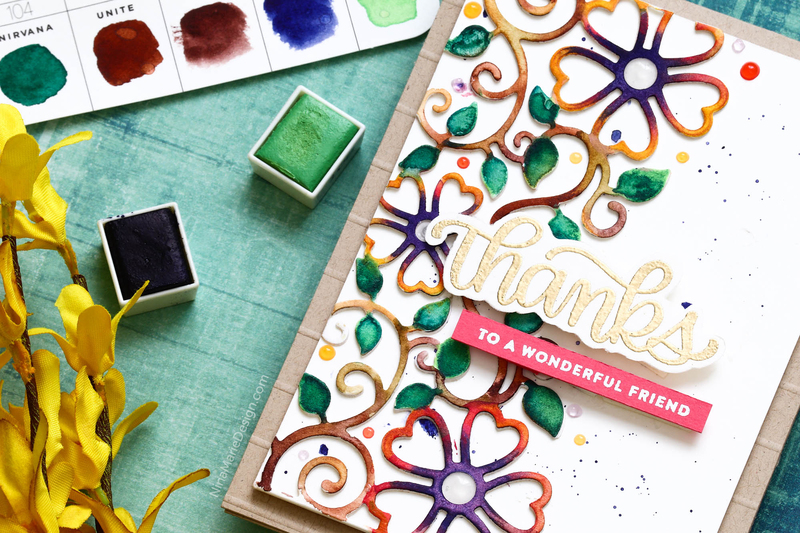 Prima’s watercolors are so much fun to mix and match and this stunning die from Spellbinders features lots of areas that can be colored. I mixed my colors on the florals to get new shades, which makes this card – and the die! – able to be customized in just about any way! I layered the watercolored die cut onto three other layers of plain white Top Floral Panel die cuts, which adds dimension to the layers. I placed the watercolored panel onto a Neenah Desert Storm card base that also has some scored lines added to it. The sentiments I included in the card are from Simon Says Stamp’s Big Thanks Words stamp set and I also added a few Nuvo Jewel Drop embellishments around my florals. 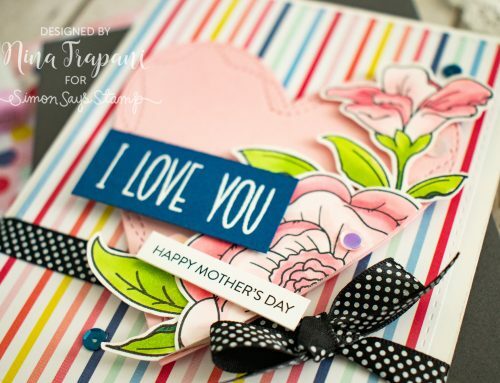 I hope you enjoyed this sweet and pretty card using the Spellbinders Top Floral Panel die! 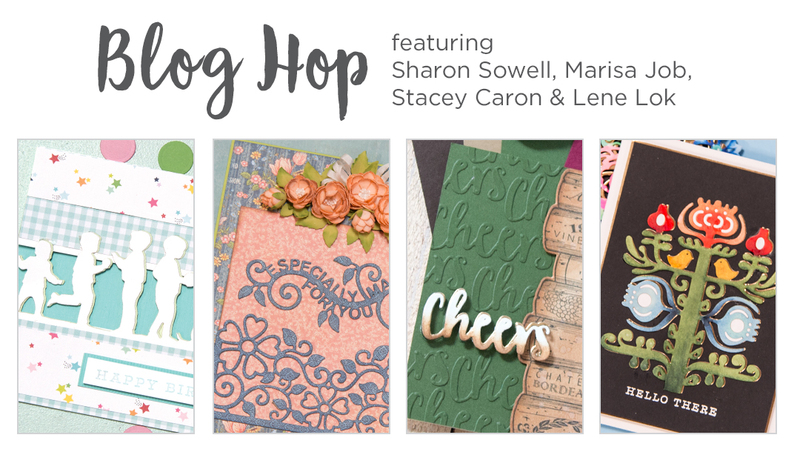 There are lots more things to see in this inspiring hop; keep on reading for the complete supply list for this card and the details of the blog hop! 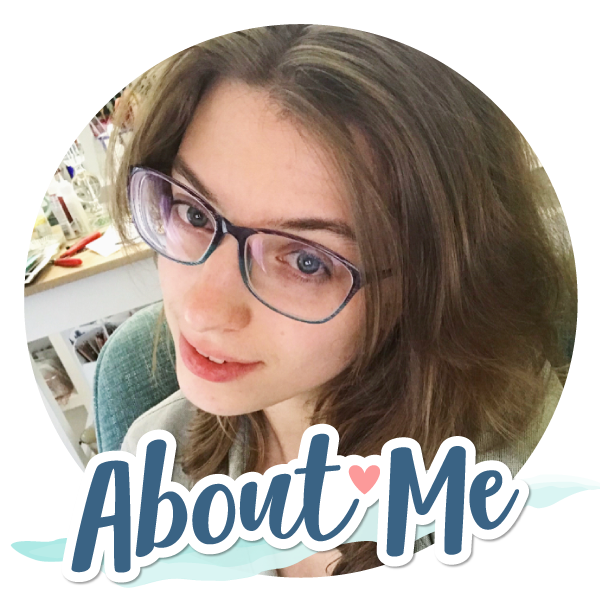 Thank you for visiting with me; I’ll be back again soon with more to share! To celebrate this release, Spellbinders is giving away a $50 gift certificate to a lucky winner! Please leave a comment on Spellbinders blog by Sunday, April 22nd for a chance to win. The winner will be announced in the blog hop post on Spellbinders blog on the 23rd. You also have the chance to win a $25 gift certificate to Spellbinders by leaving a comment here on my blog! Please leave a comment by Sunday, April 22nd for a chance to win. The winner will be notified by email with details on how to claim the prize. Note: Giveaway winners are responsible for shipping cost, duties and taxes. 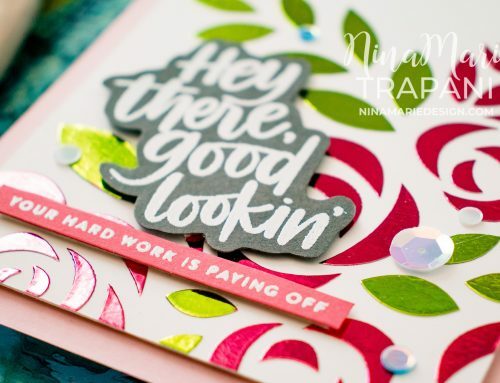 Nina-Marie Trapani – you are here!! Love this vibrant colour palette and the lovely die cut on your card. Fabulous. Love how you colored the die cut. These new releases are awesome! Love what you have done with this one and the watercoloring is beautiful. Lovely card with beautiful colors and details! So pretty. I love delicate dies, and the watercoloring is gorgeous. Can’t wait to try this one. Very beautiful card. Glad you had some vacation time, and happy you were able to hop along! This is so cool. I would never have thought to do this. Might have to try now!! I love that Floral Panel! Your coloring is so beautiful & I love your design! I watched your video on how you colored the die cuts – so simple! The colors you chose for this card are so pretty! I love the watercolored die! Gorgeous! Beautiful card. That die is gorgeous. I love the colors you selected. Thanks for sharing. Such a beautiful die you chose for your card! The watercolors are gorgeous and look especially nice with the Desert Storm cardstock! Love these! Thanks for your ideas. Wow!! That die is lovely and the watercolors make for a beautiful card! I really need to get the watercolors. They are so beautiful on your your card. Very pretty Nina-Marie. Love the rich water coloring on the pretty die-cut. The heat embossed greeting adds another great texture to the card. I’m a huge fan of the use of watercolors. Terrific cards!! Pretty cards! :) Love your watercoloring!